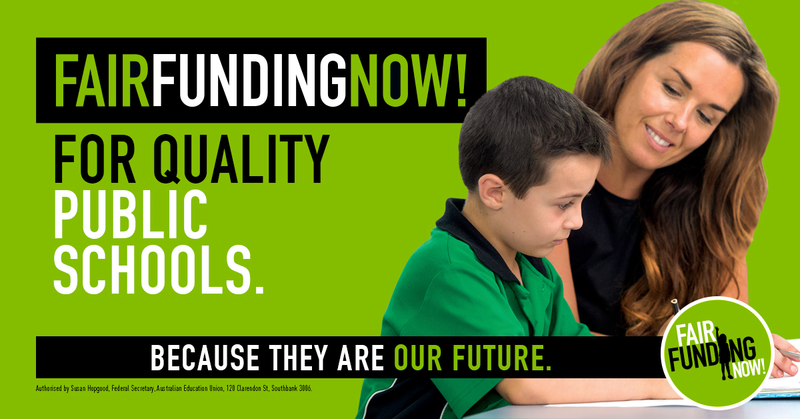 Fair Funding Now! Is a national campaign run by a community of people, parents, teachers, principals and citizens, working together to speak up and demand fair funding of public schools. It is authorised by Australian Education Union. What we want is needs-based funding that ensures all schools can meet the agreed school resource standard. But the Turnbull Government legislated to cap Commonwealth funding to public schools at 20% of what they need to reach the minimum schooling resource standard. The Commonwealth will fund private schools to 80% of schooling resource standard. Some of the biggest increases in funding go to the schools that need it least. That isn’t fair and it certainly isn’t needs-based funding. Reverse the $1.9 billion cut to public schools in 2018 and 2019.